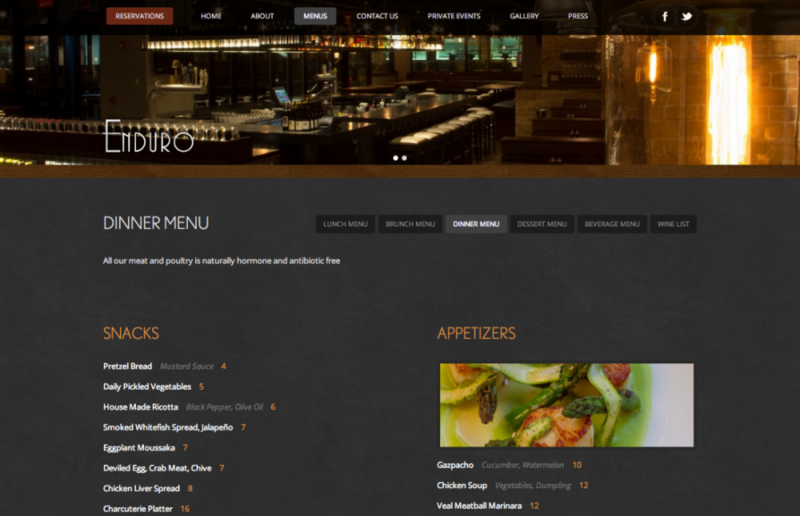 Enduro is a brand new restaurant located on Midtown’s east side. Featuring an open dining room & reclaimed wood, our goal was to bring that experience right to your screen. The website emphasizes the experience of the restaurant by using large photos and wide content areas to give an open and airy feel. Special features include a customized Opentable reservations form as well as an Events & Specials section that slides when multiple items are being promoted. The WordPress CMS also makes it even easier to customize and maintain menus, upload new photos, and add more press. Additionally, the responsive design optimizes the site for desktop, tablet, and mobile devices.